Time has been passing so quickly. Two more days and I'll be on an airplane on my way to Korea. After 6 days of work and a rushed trip back to the Midwest to visit family I'm back in Alberta. I was a little worried that with my lack of climbing over that time I would lose some fitness but I seem to still climbing okay. The little bit of climbing I did on and old stone silo and on the structures in a city park seem to have held me over. So far this trip has been mostly climbing for fun with Rebecca. We got a short day in at Haffner after flying into Calgary on Saturday. 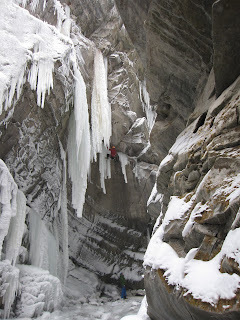 Bec Hadn't been on ice yet this year so we mostly climbed ice and did some easy mixed routes. Sunday I did some training with Malcolm. We worked on mock World Cup climbing which I did pretty pretty good on. 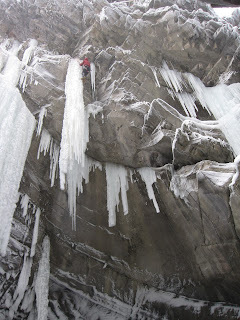 We went thru the preview, warm up, short isolation time and then climbing process. I have been learning a lot with the days I have been able to spend there. Monday Bec and I went back to Haffner. We climbed a lot more ice and more moderate mixed routes. I finally got to use my new Fusion Ice tools. I'm pretty psyched on them for ice and easy mixed. Bec topping out on Californiacation at Haffner. Tuesday Bec and I joined Jen and her friend Kyle for a day trip to the Bull River. It was a lot of driving but thankfully Bec and I got to just ride and try to rest while Jen and kyle did all the driving. The Bull isn't a very big area but its pretty cool. After rapping into the canyon we started out on a Scottish style M6 mixed route Called Sheep on a Rope. After the quick warm-up I was elected to hang draws on the area test piece, El Matador. 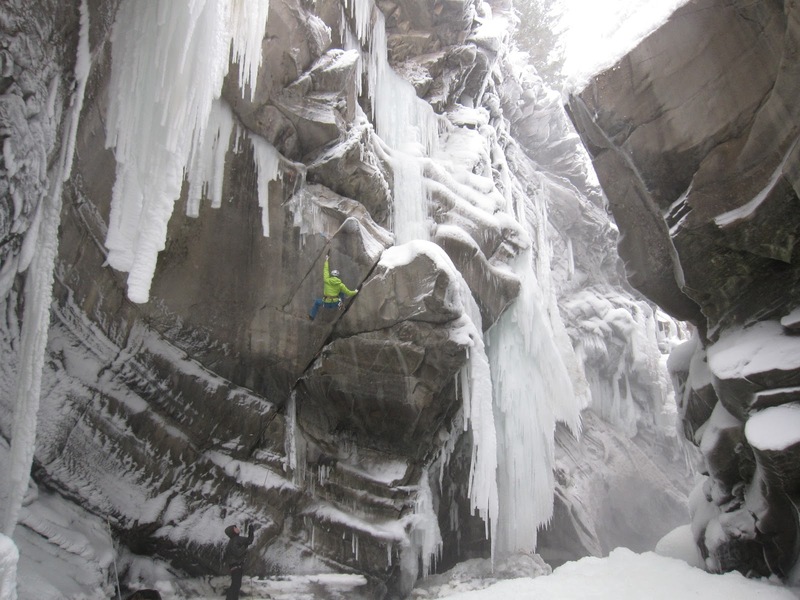 In the summer the bottom of the route is underwater and the second bolt hanger had spun off from the river current forcing me to climb up to what would be the third bolt before I could clip my rope in. 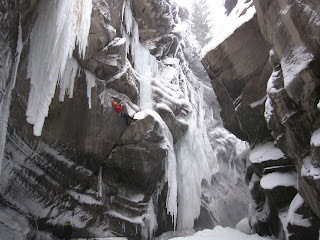 The route had a lot more ice on it than usual but it made the route really interesting and fun. Bec on Sheep on a Rope at the Bull River. 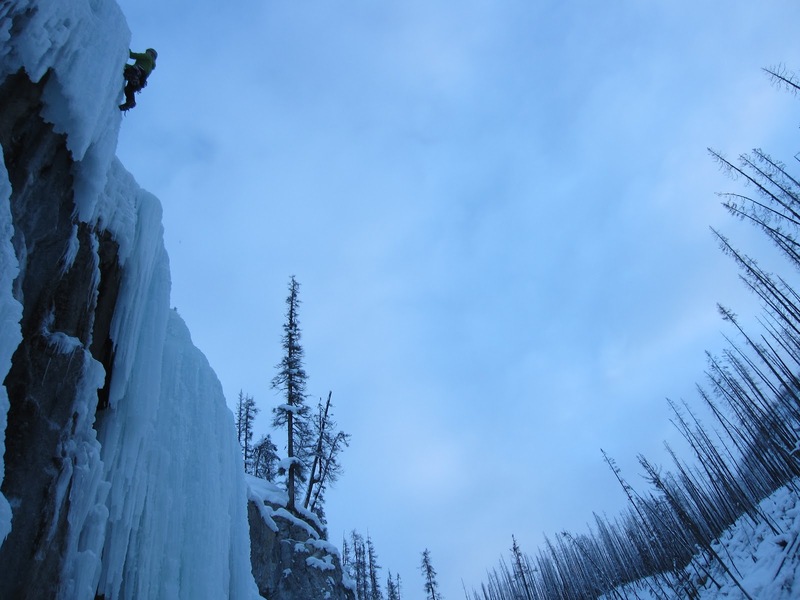 Knowing the route was fully bolted I didn't bother bringing any ice screws along which turned out to be a mistake. After reaching the big dagger that leads to the top I couldn't find the last few bolts which were burried in ice. 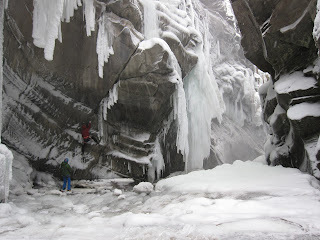 The ice up to the anchor was easy, but the runout was exciting and a little scary. Getting to the big dagger that leads to the top. Just below the ledge where the route finishes. Jen took a run up it to check out the moves and did really good. I'm always impressed when I watch her climb. She is climbing really well right now and I think she is still a long way from reaching her full potential in hard mixed climbing. Jen latching the hard to hit hold. Heading up El Mat the second time I wasn't sure how well I would do. The moves down low are fairly tough and there is a hold that is hard to find and not super good once you get it. 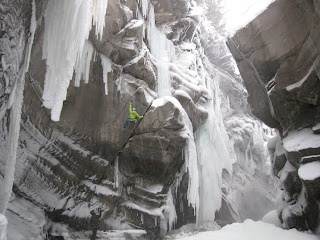 Armed with a couple ice screws I set off to try and climb the route without hanging on the rope. 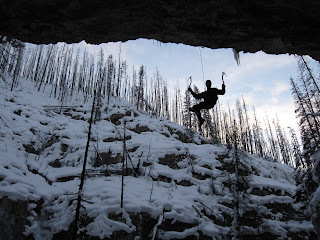 Swinging into the ice on my redpoint. The drytool section went better than I expceted. Fortunately Jen had figured out some good beta for doing some of the moves and it wasn't long before I was swinging my tools into ice. 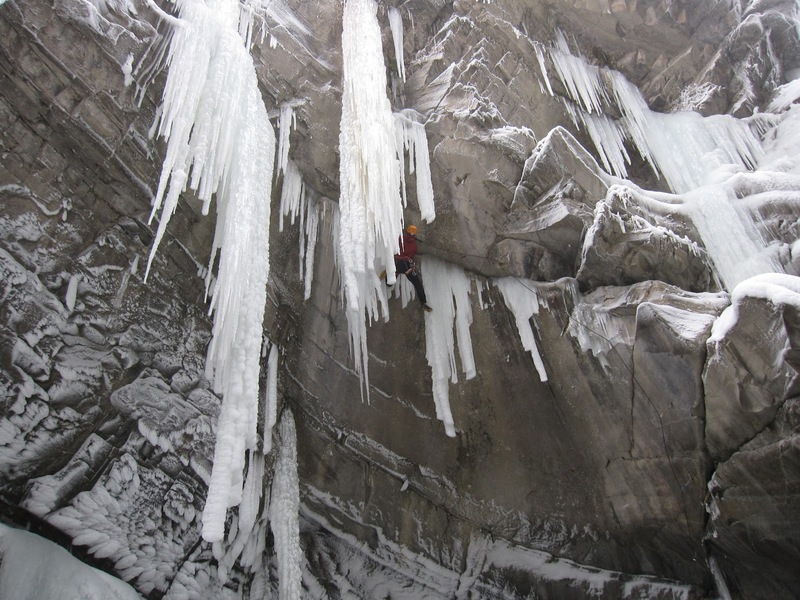 The leftward traverse involved swinging and climbing between ice daggers that were just big enogh to be used as footholds. They were rather thin and I could feel and see them flex as I weighted my feet on them. 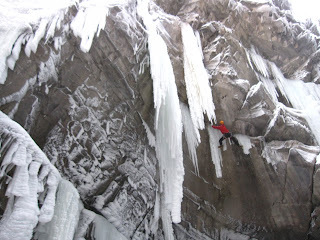 After the series of small daggers I was able to climb onto the huge dagger at the end. I good screw placed into the blob of ice where one of the smaller daggers spliled out from the rock eased the runout to the top. 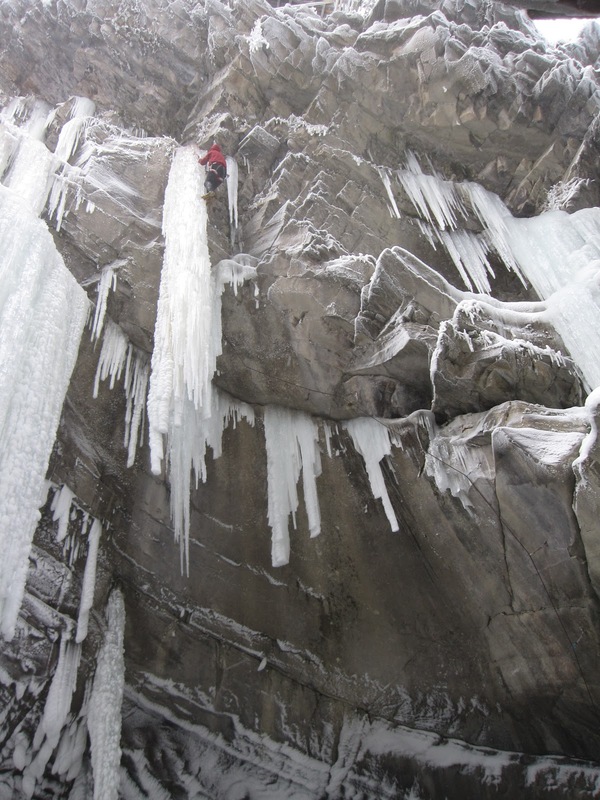 Traversing across the thin daggers. 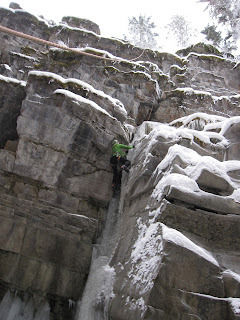 Wednesday I was back out at the Haffner Cave for my first time of the trip. 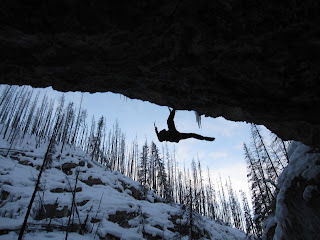 There is a route there called Neolithic that I had been saving to try to climb first try. Instead of climbing the usual warm-up route I had always climbed in the past I started out on Caveman which went really well. After second warmup lap on Caveman I was still unsure if I should try Neolithic or not. I had been saving it over the last few trips for a day that I felt rested and able to give it a good attempt. After waffling about whether to do it or not I decided I just wanted to get it out of the way. Just about to pull the lip and reach the anchor on Neo. Starting out is awkward at best. I clipped one tool to my harness so I could have one hand free to grab a small undercling hold and reach up to the first tool placement. Getting itno the tool placement was actually easier than I thought it would be, but then I realized I clipped the other tool to the wrong side of my harness and I had to do some extra hanging out while I swithched ahnds to grab the other one. Once I had both tools I was ready to do the big span move. Of course I didn't really think about what I was doing and then just smeared my feet and they proptly slipped off leaving me hanging by one arm. After realing back up agian I found a good divot for my left foot and launched to where I hoped the hold was just over the lip of the first roof about 7 feet away. My pick found the pocket and then I was quickly letting my feet swing down and releasing the lower tool. Form there it seemed like I had the wrong hand on the wrong grip and I couldn't make the most of my reach. I spent a lot of time trying to sort out what grip to be grabbing. My hands started opening up and I was able to recover enought to do a few more moves, but I just didn't move efficiently enough to keep going. After falling off I bumped back up to the bolt and worked out the rest of the moves to the top. After resting a bit I jumped on it again. 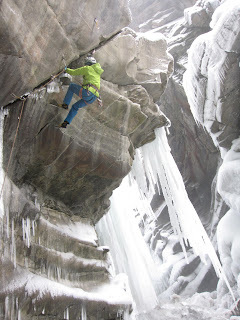 This time I had a definite plan of how I would go for each hold on each grip of the tool and I was able to climb through the hard moves down low and reach the easier section where you can get a lot more weight on your feet before getting too tired. From there it was just a couple long pulls to the anchor. Failing on it first try was really disappointing but a good learning experience. Looks like quite a wild route. Nice.